If you suffer with poor circulation, pain, or inflammation, you'll want to try these amazing socks. 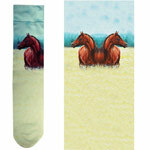 Galloping Horses are running all over these Hunter Green socks! Classic pattern with horse head and horse shoes with the word horses on a black sock. Boot Socks that are really Great These are by far the nicest boot socks we have come across. They have padded foot that extends up past your Achilles tendon where you always get that nasty rub from your boots. Coolmax Boot Socks Designed not to constrict so they won't leave those unsightly impressions on your calf! Black cool-max nylon/spandex socks are comfortable & perfect for riding. These socks are fun and funky when paired up with your favorite paddock boots. Individually hand silk screened smooth & silky boot socks fit well & last. The smoothest & silkiest boot sock ever made, individually hand-silk screened for greater detail. Silky smooth fabric & a cool, breathable weave with a twist on argyle make the perfect boot socks. Silky smooth fabric with a cool, breathable weave in a pretty bright argyle print, in 3 colors. A constellation of dreamy horses and stars will inspire your inner spirit horse, in adult or junior size. Medium weight adult ankle socks with adorable carrots, ribbons & horseshoes in comfy cool fabric. Cool & comfy stylish boot strap socks are 75% nylon, 25% Terylene & 2% spandex, in assorted colors. Strong mid weight socks are comfortable & wearable in every climate & every discipline. Unconventional and slightly zany, scrumptiously soft knee high socks, no two pairs are the same. Scrumptiously soft kaleidoscope and horse socks will keep your feet warm & comfy. Three pairs of beautiful equestrian socks, Black Fire, Many Colored Mane & Eye of The Beholder styles. Long lasting wear, medium weight with cool fabric & accented with soft gold sparks. Fire up your riding style with these comfy paddock boot socks, with gold spark accents. Horse socks are made from spun acrylic for comfort & prevent friction blisters & chafing. Individually hand silk-screened for beautiful detail & they maintain a great fit. Keep in step in these soft & long wearing all season socks with adorable retro horseshoes.